Last Thursday I decided that I was going to throw a holiday part at my apartments and invited all of my friends. So my roommates and I kind of threw it together in just two days, but I think that made it even more fun because we didn't have to stress out about everyone coming and what to fix for weeks like we would have if we had planned the party at a reasonable amount of time. Even though I asked people to bring a drink or refreshment with them, I decided that we should definitely make some just in case. So i went online to find some easy recipes that I could fix that would be party friendly. When I was online searching for that stuff, I came across the website www.ClearWireInternet.com and after I looked through most of it, I showed it to my roommates and we signed up for an internet packages we found on there. One recipe that we made that was such a success that everyone ate it before the part was over was a smoky cheese ball. I had had some of one once at a party and thought it was great so I knew that my friends would like it too. It has been a tradition to have 12 kinds of round fruits on the table on New Year's Eve. 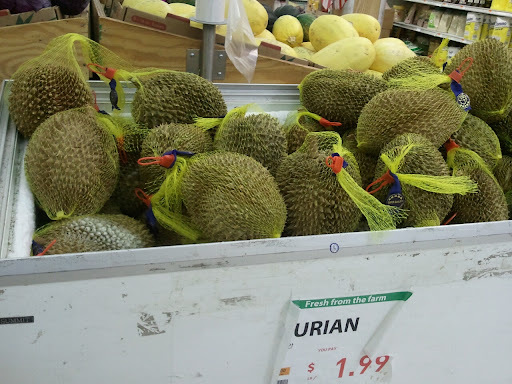 So to complete the 12, we went to the Korean Supermarket then I saw these frozen durian fruits. 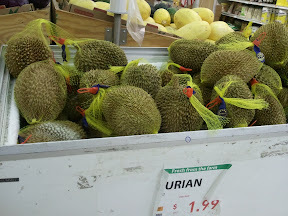 Yes, we do have them here but they are frozen at $1.99/lb but Hubby decided not to buy them. He said he does not want to deal with the smell on new year's. He is not from Davao that's why. We have a family tradition around here at Christmas time. My kids love to watch A Charlie Brown Christmas. It has to be done every year or Christmas just isn't Christmas around here. We've been doing this since the kids were about 3 years old and even though one of them is a teenager now, we still watch it every year. We like to watch A Charlie Brown Christmas on our Satellite TV. I always make hot cocoa with whipped cream for everyone and my oldest daughter pops up a huge bowl of popcorn. It usually airs on ABC during the first week of December. My kids love Snoopy and Linus and I think they just love the whole flow of the story. If you asked my kids what they look forward to on Christmas, I have no doubt in my mind that they would shout Charlie Brown. It's exciting and it really gets you in the Christmas spirit. I love the smiles it brings to my children's faces as they sip hot cocoa and munch on popcorn. Hopefully they will pass the tradition on when they decide to start their own families. I know I will be there to bring in the tradition with them! Feel so hungry but lazy to go out and buy food (too much snow outside!) 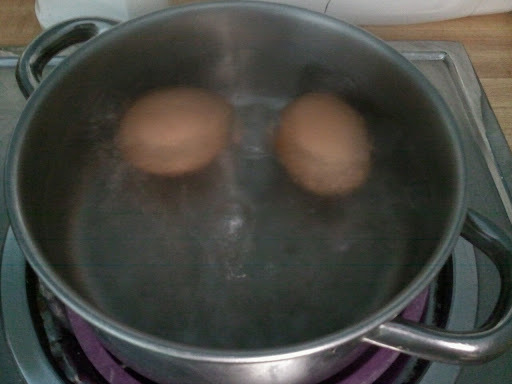 I decided to boil some eggs. I'm not talking at my home kitchen but at work. Our lunch room/kitchen has a two burner. So here, while waiting for my eggs to get done I took a photo. It's been almost 10 minutes since it started boiling. My breakfast is ready in a minute. Yehey, two more days to go and it’s another long weekend. Thanks for the snow for making the work week shorter. We were already assured today that we get paid for the Monday that we did not come to work because of the snow. Eight people made it to work. I did not even try. I know it was so risky to be on the road in a blizzard. promised anything on a new year but this 2010 I have been doing a credit repair by paying off outstanding credit card balances. I regularly run my credit report to check my score. I don’t think I need the help of professional credit repair services but I just want my credit score to be a bit higher. Just in case I make a major purchase this coming year, I can easily apply for a loan with no problems. unfulfilled, I guess. I am one guilty person. So this year, I am not making any but I will try to make 2011 a better and more fruitful year. Happy New Year! Our supermarket was packed. You can hardly find a parking spot. This is the same scenario at Home Depot for salt, shovel and snow blower. Luckily, I don't have to park when I went to the supermarket. My husband was with me and he was the one driving. Cartoon Network is easily one of the top childrens networks to watch on television. They have regular episodes and unique shows that differ from the other top networks. In addition to offering daytime childrens programming, they have a nighttime programming line up called Adult Swim that provides entertainment for grown ups with a desire to enjoy cartoons for a more mature audience. In terms of the cartoons available, The Marvelous Misadventures of Flapjack and Chowder are two of my favorites. While they are for kids they provide me with tons of laughs each day. Sadly, there will be no new episodes of Flapjack since it was recently canceled for future episodes. Cartoon Network is one of the higher quality programming channels. There are always new and interesting shows. Most of them are for older children and teens, so they are more relatable than "baby" cartoons like Blues Clues or something similar. This is my favorite channel that is only available on Cable Television Service. Without this channel available I would be considerably bored with other programming available. If you enjoy interesting and unique cartoons and other shows then http://www.cartoonnetworkhq.com/tw/signup/consent/page CN is something worth watching! I thought we would be able to make it to Smash burger before the snows starts to fall. On our way, hubby was called by his job to report for work. He needs to be at his job when it snows. We just have to make another trip next time. I want this burger with french fries. I thought we are going to have a white Christmas. The snow missed it for a day. This is the first snow of the season. Winter officially started last Dec. 21st only although we already had several below freezing days. 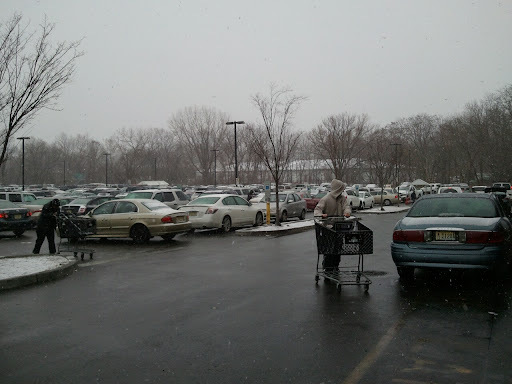 I do not know if people just got excited of the snow or really in the panicked mode because when I went to the supermarket today, it was super packed with lines at the cashier was so long. I turned around without buying the magnet signs that my daughter had wanted for her friend. That could wait i said. I was only at the store for a few minutes but when I went out to check where my husband parked the car, I could not see the cars' license plates anymore. We were already in a blizzard condition with almost zero visibility. Even with your headlights on, you can hardly see who is in front of you. I was wrong when i thought the people were just over reacting. My bad! The snow ends by tomorrow noon leaving around 10 to 18 inches. I am not sure if I have work. It depends on the situation when we wake up tomorrow morning. I drive 15 miles to my job but I do not like to take chances. Hope it will not be that bad. I pity those who have to be on the road but please just stay home to be safe. We tried to be different for our Christmas eve dinner or noche buena. It was just only a simple dinner with my BIL family since we are the only closest as far as where we live. We opted not to travel far for Christmas eve. Not in the picture are the ham, cheese cake and crema de fruta. They are all pot luck. It was a nice christmas eve dinner then opening of gifts for the kids. We ended the night through skype conference with our families in the philippines, watching them in their christmas day lunch. back home because it was pouring. Rain, rain go away please! 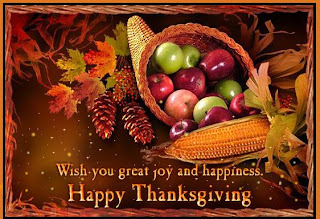 Wishing everyone joy and good tidings this holiday season. Hope you are enjoying your Christmas with loved ones, family and friends. The holidays are always a time when I let all of the dietary restrictions that I normally place on myself go. But this year my doctor warned me that my bad cholesterol is too high so I'm trying to be more careful about it. I thought that one of the ways that I could do this was to take a page out of the vegan cookbook and try and make some yummy Christmas treats without all of the eggs in them. I went online to try and find some good recipes that fit those restrictions but would still be edible and good by my standards, which can be pretty tough. While I was looking up that stuff I actually came across some clear 4g information and after I read through it some, I decided to change over my internet service to that provider. After a whole lot of searching and going through the recipes and comments where they were posted to make sure and see what other people thought that actually fixed it, I found this one eggless Christmas cookies recipe that I thought looked like it would be pretty good. I tried them and though I'm sure they would have been better with eggs, they were surprisingly good. It is a school policy that when you bring some food to school as part of your child's birthday celebration, they should be store bought and sealed plus no more goodie bags. Thus, no more cupcakes or birthday cakes and ice cream to school. Last year, I ordered cupcakes but because of this new policy, I just bought oreo cookies and candy canes then taped them together plus boxed juice. Just bring your treats to school and leave them with the teacher. When are they going to have their snack, is up to the teacher. My daughter has 24 classmates so I made 4 extra but she ended up taking the 4 home. The weekend went by so fast. I was actually off Friday to prepare for my daughter’s birthday party Saturday. Also, I have brought some goodies to her class last Friday as a treat for her birthday. After I dropped her off to school, I went to the mall to buy things needed for her party then went to do cleaning. In between my household chores, I have to call some wholesalers confirming my orders for my online store. I was able to meet some sellers of wholesale products when I attended a bazaar so I have been in contact with them through phones and emails. Luckily, they carry wholesale products I need for my store. I’m running low with my inventory so I need to refill my supplies for my buyers. So, as I was saying, Friday was cleaning day then Saturday we had a small party for my daughter. I did not do any cooking for lack of time. I thought we will be more relaxed by not cooking but because of the Christmas holiday, the traffic was so bad that we got late in picking up the food. Some of our visitors were already arriving when we got home from the catering. They are all family and friends so there was really no problem. It turned out to be a nice party; kids had fun especially during the opening of gifts. My daughter was the only female among her cousins and nephews (yes, she’s already an aunt!) so every time the boys see Barbie gifts they throw them in the air. My baby is not a baby anymore. I now have a 7 year old first grader. How time flies! This is my daughter's birthday cake when she turned 7 last Saturday. It is a mocca cake with a hello kitty design. I ordered it from red ribbon. They did a good job and the cake was very delicious. Those small hello kitty designs are rings that kids ended up wearing after they sang happy birthday to my daughter. How did i not know right away? We already have a Max's restaurant here in New Jersey (although around 15 miles from my miles but still NJ - don't mind!). Yehey!!! It is located in Jersey City where the first Red Ribbon is. A friend from my daughter's party told me that they just went there two days ago. We gotta go there. I haven't had their chicken in yyyyyeeeearrrrssss!!!!! My husband got hooked up on eBay. I have been buying on ebay and online for how many years until I tried selling some stuffs myself. I love shopping for cheap clothes anyway so might as well try if I can make money out of it. While I was doing this, my husband was just on the side not paying so much attention to what I am doing. One day, he got curious and started searching for tennis shoes. He ended buying it actually then one thing led to several purchases online. It is not that bad after all. My husband is still getting the packages soon. They are all scheduled for redelivery and we fixed the address sign outside. Because me and hubby felt so guilty after eating too much pork (lechon) and sweets at the christmas party we went to last Saturday, we decided to have the ginisang ampalaya with eggs for dinner. We are not getting any younger so we get conscious with our food intake these days. It's not like during our younger years. I took a photo. I don't think I did a good job. Just came from the pot and I think i put too much egg. I 'm not a good cook but i always try. Reindeer are one of the most important parts of any Christmas decoration season and they take a large portion of my home during Christmas. I have them in ornaments, light displays, wall hangings, and more. To put it mildly, reindeer are the creatures of Christmas in my home and I fully intend to keep it that way. There's nothing quite as wonderful as knowing that I have a flock of wonderful reindeer watching over my home during the Christmas season. You have to love that sort of thing. As everything progresses during the season, I usually find one or two more reindeer collections to add to my home. Everyone, including the spouse, loves Christmas reindeer and loves to enjoy them in decorating form. We also love to admire the reindeer themed Christmas shows we watch on satellite TV from http://www.tvbydirect.com/directv-channels.html. We also have a lot of reindeer Christmas ornaments that make our tree festive and happy as it can be. There's nothing more important to me than having a tree that's at least 25% reindeer. To me, they're the mascot of Christmas and something that I will always incorporate into my Christmas decorating adventures. My family loves reindeer, I love reindeer, and we all go out of our way to make sure that the spirit of Christmas is kept by putting these decorations all around our home. I ordered it from Red Ribbon. I'm so happy they put up branch in my county. I got the sanrio cake for isabella's birthday on Saturday. Oh, I mean hello kitty, not sanrio, duh. As long as you know what design you want, you can place your order over the phone. Just be ready wirh your credit card no. Now that it is winter time, I would surely miss my neighbor who always helped us in plowing the snow. If it snows all night, the first lawn mower you hear as soon as you wake up in the morning is my neighbor’s. Both the husband and wife have relocated To Florida where it is warm and sunny all year round. They have also put their Dallas Homes for Sale then bought a small condominium down south. I even checked the Dallas Homes For sale listing and sure enough I found their lovely 3 bedroom ranch in the market. I just hope that Dallas Real estate is not affected by the slump in home pricing. So i was able to post through using the blogger's apps for android. I got so excited that i can upload pictures directly from my phone to my blog but I think the picture is quite big. I guess there is a way to make it smaller. That i still have to figure out. So guys, if you have an android phone, download the blogger apps (it's free) so that you can start blogging from your phone using the apps. So easy. This is a test android blogger apps from my andoid phone. Hope it works. It says I can upload pictures to my posts - pictures I took using my phone, then blog about it. 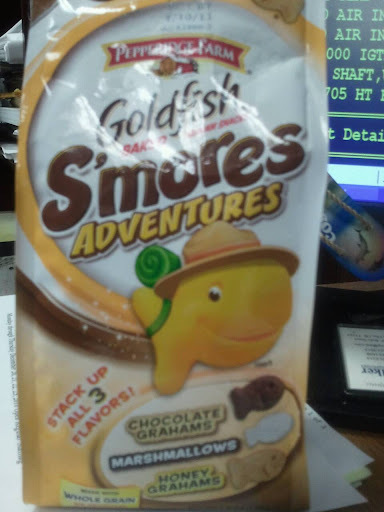 So i took a photo of my fav goldfish smores i am munching right now. If this works, all I could say is IT IS AWESOME!!!! I thought I would be able to go to Brooklyn this Saturday. My cousin is going home to the Philippines on December 19th. We are supposed to see each other this Saturday so that I can bring to his house my package for my folks back home. New York and New Jersey are just a river apart but I haven’t seen this cousin of mine for years. Our schedules do not meet and both of us are always busy. We keep in touch through facebook or text messages. So as I was saying, we agreed to meet this Saturday but after few days he sent me a message that if possible I have to be there before 9:00 in the morning because he has an overtime work starting at 10:00 am. I said, that’s fine. There is no problem going to New York early. Now, I just sent him a message that I cannot make it on Saturday because I have to make up for my hours at work since I left early yesterday to pick up my daughter from school who was sick. So what’s going to happen with my package? There is no other option but to send via mail to his house without the 20 chocolate bars that the kids ordered. They are too heavy. They can wait for my box via sea freight. I just sent the kids some money to buy those chocolates at the duty free shop. 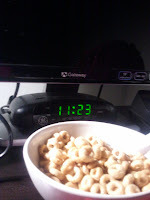 I know it's almost midnight but I feel like I am hungry. I ate dinner though. 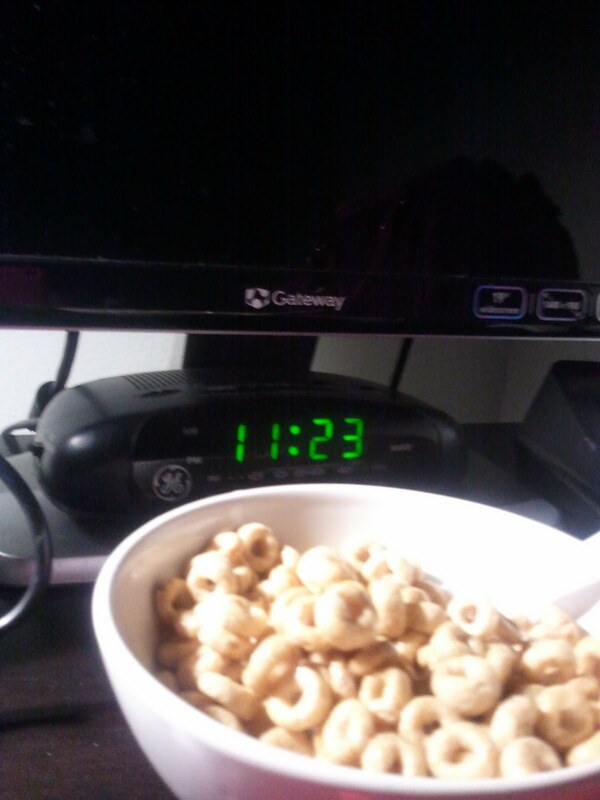 So it won't be too much guilt, I got myself a bowl of cheerios with 2% milk. Everybody is already sleeping. This is what happens when you are not used to taking a nap in the afternoon. Sorry for the blurry pic. Took it with my cellphone with just the night light on. a credit card. I told her I am not going to put my credit card number because these weight loss diet pills promo are sneaky. It is free for a certain period but if you forget to call them, they will automatically charge your credit. So what she did was she went to buy a prepaid credit card and we used that card to order the diet pills. She was taking them religiously then she goes to the track and run every day. She was determined to loose weight and it worked for her. Now she is back in the Philippines. She always sends me text messages about the compliments she gets from her friends. I told her to keep up with her regimen and have a lot of self discipline with regards to food. You think you can resist not eating this holiday season? I cannot. There is something new with Wendy's french fries. It's the Wendy's Natural cut french fries made from whole Russet potatoes, naturally cut cooked with the skin still on it. 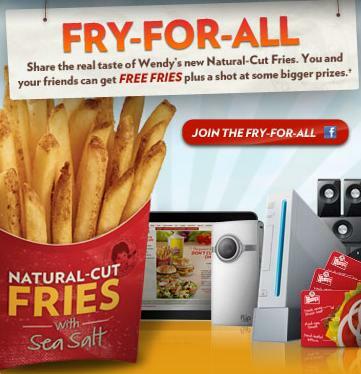 Instead of using iodized salt on the fries, Wendy's uses sea salt. Let us all try this new natural cut fries fries for free by going to wendy's website and get a coupon. Other big prizes also awaits the lucky winner. The weather is getting colder every day. The wind chill is 10 degrees below temperature. Gone are the days of 50’s and 60’s with some sun. I looked at my plants from my window and all the leaves are gone. I just removed the flower boxes hanging on our porch to protect them from the freezing morning. The plants by our big window will suffer from this weather because the window boxes for plants are installed permanently to protect them from accidentally falling on the road. I cannot take them inside the house. These plants just have to be totally replaced come spring time. have a green house outside with controlled temperature to save my plants during winter time. While having our car filled up last sunday, i took a picture of "on the run" the convenience store at exxon gas. i go to on the run for their crispy creme, buy sunday paper, gum, scratch off and lotto tickets. I haven't tried their bengal trader coffee. A lot says it's good. Maybe i'll get a cup next stop. I went to my daughter’s school last for PTA night. It is a one on one dialogue between the teacher and parents regarding your child progress for the first grading period. My schedule time was between 7:15 p.m. to 7:30 p.m. but I arrived at the school early hoping that we can start right away. I guess the parent ahead of me was late so I got the chance to read the school bulletin boards while waiting for my turn. Each grade has their own bulletin board, displaying all their activities, pictures and who the student of the month is. So my daughter’s face was on one of these bulletin boards last year. So far my daughter is doing great in school with only one comment on her report card – being talkative at times. Somewhat I already expected this because she also tells me that she is chatty in school. I always remind her that there is time for chatting but if the teacher says that you have to pay attention you have to stop talking, I know this is hard for some kids but they will learn. My next PTA meeting is next month. I will see how make with her science and social studies. They only started with these two subjects this second marking period. So this is what me and my daughter shared when we went to McDonalds for breakfast. Hubby got one for himself too. I ate the pancakes and sausage while my daughter likes the eggs and hashbrown. Nobody eats the biscuit. I am going through my daughter’s tests and exercises from her English, Science and Social Studies. She normally leaves them inside her locker at school but I requested that she brings them home for the weekend. The school lockers are safe for her books and school supplies to keep but during Fridays I want her to take them home for study. At least now, she has mastered how to do the combination locks for both her school and gym lockers. We made the same code for both that is easy for her to remember. What I do with all her school tests and exercises is make copies then I use them as her reviewer for her exams. I made a folder for every grading period and file her papers according to dates. I have to be organized and be on top of everything. It makes my life easier when she needs to study a particular subject or chapter. I have been showing to my daughter how to be organized with her things. I am happy that when there was an open house in school, I got to see her desk and it was neat and clean. I told myself, that is a good sign. We know that our local mcdonald's is under construction. They stopped serving dine-in to customers for weeks and we could see from the road that they removed the play areas for kids (as my daughter say, What!!!!). Yesterday was our first time to visit the restaurant and we saw a different store - a total revamped!!! No more noisy metal chairs that people just drag, play area is gone and more updated. The furnishings and light fixtures are all changed. It is open, more space. Nice ambiance! I took some pictures to share. The last photo is the area where you can hook up your computers for internet. The chairs are more comfortable and electric outlets are provided. I would like to be here when it snows, doing my blogging while having my breakfast and watching the snow. Every year I look forward to the holidays come I know its time for egg-nog. Egg-nog is my all time favorite treat during the holidays. I was watching satellite tv and a I saw an advertisement for egg-nog, this advertisement put the biggest smile on my face. You wouldn't thing that something so simple could make somebody so happy. For me egg-nog just sets the tone for the holiday season. Egg-nog also brings back several wonderful memories from my childhood. I remember sipping on egg-nog while helping my Grandma decorate Christmas cookies. My Grandma would also add a little nutmeg to my egg-nog and I thought that was the best thing ever. I am now passing on the tradition of drinking egg-nog and decorating Christmas cookies with my children. Egg-nog is a great treat during the holidays for children and adults. You can add cinnamon or nutmeg to egg-nog and you can even drink it in coffee. Egg-nog also goes well with warm pumpkin bread. No-matter which way you choose to have your egg-nog make sure to enjoy this holiday drink while watching tv from DirectStarTV.com. While waiting for a parking spot at the mall around 5:30 pm eastern standard time. Our IT person was in our office today to fix two computers that got infected by viruses. She could not get rid of the virus remotely so she has to be physically in the office to do it. We all got scared because she might take our internet access totally. Almost every week we get hit by a virus from websites that we visited and being a company computer we are not actually allowed to do our shopping online. Tell me, who does not do their online shopping at work? Thank God, our IT person was not in a bad mood today so we did not get punished. She is also woman, I bet she does what we do at work too. nice to me this Christmas. Friday night is my day off in the kitchen. My husband does not like to eat heavy dinner because it is his tennis night with his group. We normally just buy food to go. 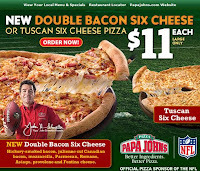 I'm in the mood to eat pizza so maybe by tomorrow we can try this new double bacon six cheese from papa john's. I like papa john's pizza and $11 is already a good price. We always order the barbecue chicken but we will try something new tomorrow. Our niece that used to occupy one bedroom in our house left for Philippines the day after thanksgiving. My daughter is a bit sad because it’s back to only the three of us in the house again. I don’t know how you call it but every time somebody leaves (I have done this when the two step daughters moved out – one to college and the other one got married), I want a revamp of the room where they used to occupy. This time, I want my daughter to use the bigger room, the room the niece used to occupy so that I can make her old bedroom an office or computer room. I know it is a lot of work but I am so determined to do it. First, I have to get rid of all those vhs videos stored under her bed. I need a video converter for this. It has to be a video converter for Mac. I haven’t seen any at the local electronics store but probably I can but it online or on eBay. If there is an iPad Video Converter available, I‘ll buy it too and maybe I can get free shipping for both. I don’t want to toss any of these videos because they have so much of our yesteryears, those days when my daughter was still a baby. Those are beautiful memories that you just want to keep. Hope I would be able to finish my project before her birthday on the 18th. Once I have converted all the videos, we can watch them during her party. Let us see how my daughter reacts seeing herself as a baby on video. It has been raining all day with bad windy conditions making the temperature fall to like freezing. I know its not officially winter yet but it is getting so cold already. I am just thankful that there is no forecast of any snow yet. During this cold weather, there is no other thing that I always crave but this hot seafood noodlle from our favorite vietnamese restaurant.